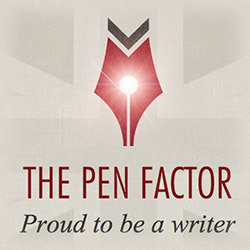 The Pen Factor | Does Daisy Dare? A comedy of manners for the twenty-first century. Uprooted from her London life Daisy relocates to the quiet of rural Cornwall. Quiet however it is not. Riotous, colourful and completely bonkers prove far more apt as Daisy is thrown into a topsy-turvy life of celebrity culture, stately homes and scantily-clad New Age gurus. Complicated further by the appearance of the devastatingly handsome, endearingly shy local landowner. Does Daisy dare to fall in love again? Together do they have any hope of untangling the confusion created by those around them? Daisy couldn’t believe her luck when she finally saw the sign to Roscombe at the side of the road. She swung her car into the lane, and did a quick double-take. Was this really wide enough for a car? It didn't look possible. However she was a country girl now, and country girls drove down narrow lanes. At speed. She certainly wasn't going to be put off by a few overgrown hedgerows. Not now she was so close to the village. The village where today she’d be starting her brand new life. Smugly she stroked her cat Kissy, currently sat purring on her lap. She was almost there and her drive from London to Cornwall had occurred with no mishaps at all. Despite the illegality and potential danger of said cat. But honestly she dared anyone to get this creature into a catbox. And she had had a trying few weeks, she certainly wasn't starting today with a battle. However Daisy’s smug satisfaction was soon brought to a shuddering halt as her car decided to do exactly the same and simply stopped going. This was not in the plan! As panic was not going to help, she gently smiled and tried to think positive things before she turned the key to restart the engine. Nothing. Not even a scary ratcheting noise, just nothing. Okay, stay calm and try again, it will work. And turn. Silence. Turn, pause, turn, pause, turn, pause, turn....arrrgghhhhhh! There was nothing for it; Daisy was going to have to get out of the car, and try and fix it. Although with only her temptress nature and a stocking she didn’t think she stood much of a chance. Mind you, it worked in the movies, and you never knew, magically, someone could drive by. Although no one was going to get past her in a lane this narrow. But if they just stopped maybe then they could rescue her, or at least help her to fix the car and she might even get dinner. This could even turn out to be an adventure. She might quite like living in the country. Strengthened by her speedy but beautifully formed romantic imaginings she took yet another deep breath, (boy was she going to be prepared for a day when she might give birth) and carefully placing Kissy on the passenger seat, clicked the bonnet button and opened the car door. Unfortunately the first thing that hit her was not the appearance of an RAC van but a rather overpowering stench of country. Leaning on the open door frame she floundered between taking another deep breath or trying not to breath at all. Admittedly one way meant certain death, but dear Lord, what did they put on the fields down here? She floundered between suffocation and faeces, then decided to be a big girl and just get on with the whole bonnet thing. Surely the answer would become apparent, and failing that she could possibly walk. Five miles wasn't that far was it? However a flash of fur and a meow the like of which she’d never heard before signified that Kissy had clearly decided that the country smell was a novelty too. But instead of retreating back into the comfort of the front seat, as any self-respecting town tom would do, he had flown across Daisy’s seat, flung himself out the gap between her legs and the door and hurtled like an infra red homing missile towards the fields. Boldly scrambling behind him she accepted that as she reached the fence, far faster than she (or her games mistress) would have believed possible, that even with this new found physical finesse she couldn’t run through it. Glancing at it quickly she ascertained that the huge padlock probably indicated that she couldn’t open it. Meanwhile she was also aware that her precious cat, having suddenly suffered some kind of personality transmutation was not just halfway across the field and on his way to the next but doing so with glee. She was going to have to climb the fence. In heels and a dress that she was never going to be able to afford to replace. She couldn’t simply leave him. Having not even reached the village yet how on earth would he find his way to their new home? Bloody bloody bloody cat! Cursing all the while she started to climb up the gate and swing her leg over a la Calamity Jane. She ignored the laddering sound, and just prayed that she wouldn’t be spending the night in the GU clinic as they fished out splinters...yes, it had happened before. And bounce, Daisy hopped over, pushing her hair out of her eyes as she landed, and feeling rather pleased with herself. Scanning the fields for the cat she found it next to impossible not to just, for only a second or two, take in the pastoral beauty of the scene. It was actually rather nice to be surrounded by fields and gates. There was the prerequisite herd of cows in the next field over, mummies and babies grazing happily together, and copses glittering on the horizon, dotted about thick and fast. Even the stench was becoming less noticeable as her nostrils were slowly adjusting. Birds were flying and swooping and nowhere was there an unremitting honk of traffic, or squawking of bad-tempered humans. She saw a flash of cat streaking across the field in to the one with the cows. Bugger! Whilst they looked nice from a distance she had never actually seen a cow apart from through a car window as she drove down a motorway. Crossing the field suddenly became rather daunting. Yet another deep breath, and Daisy decided to be brave. She was not going be scared by livestock, especially not ones with pretty faces, she could do this. She began to jog across the field shouting for the cat as she ran. Surely the wretched animal would hear and come trotting obediently back. But no, either the wind was distorting her call or her previously well-behaved house cat had become feral in a matter of minutes. First field crossed, now into the next. Luckily this gate had a pull-y arm thing on it which opened fairly easily, no more climbing and bouncing at this one. Realising that as cross country at school had involved a shortcut at Bonkers Barn and a fag, and managing country terrain in her city heels was a far from easy task, she decided it was better to saunter across this one. Thus saving energy and preventing likely cow alarm followed by a trampling. Such sauntering whilst keeping a keen eye on the cattle, who looked less pretty and slightly menacing the closer she got, (they really were very big) meant that she wasn’t paying attention to the ground across which she was walking. Not paying attention that was until her heel went into a small dip, twisting her foot and making her lose her balance. With an unexpectedly high pitched squeak she found herself falling to the ground, all arms and legs a-floundering, landing with a bump. Sitting in a field having lost her cat, and wearing a mix of Miu Miu, grass, mud and cowpat was not how she had imagined her journey to Cornwall. Tentatively she ran her hands down her legs, spitting hair out her eyes, and massaged her ankle, it didn’t feel broken or even twisted. Unlike her shoe which quite clearly was never going to grace a chi-chi night out again. However right now, Daisy simply didn’t have the energy to care a great deal. That and the fact that she had resigned herself to the departure of chi-chi evenings from her life a couple of weeks previously. Somewhere around the point her boss/lover/landlord had sacked/dumped/kicked her out. Deciding rather swiftly that this was very definitely not the time to dwell on that, she looked round for something to help her up. But oh yes, she was in the middle of a bloody field and there... was...nothing. Twisting her body round she propelled herself into a salutation to the sun and managed to stand. Right, enough was enough. She was not putting up with this any more. She was going to find the cat, get back to the car, ring for help and put an end to this nightmare. Scanning the fields yet again, grrrr, she could see no apparent sign of Kissy. It seemed that with her tumble the cows had dispersed as well, which could only be a good thing. Deciding to ditch her laddered stockings, their mere presence irritating her, she continued her journey across the field to the next gate and headed for the copse at the end. Logic dictated that if the cat was nowhere in view then it was likely to be hidden somewhere amongst the trees and undergrowth in dormouse heaven.